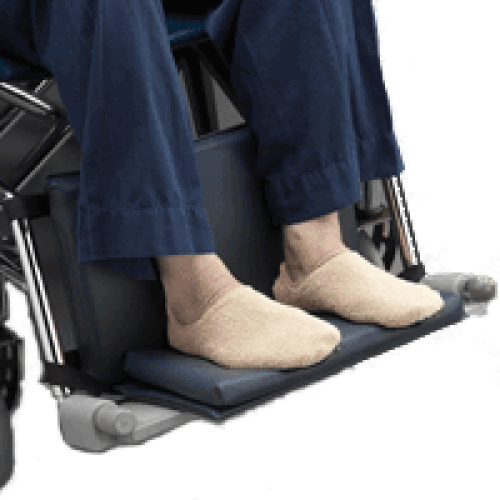 When patients need lower extremity support or leg protection, the Posey Foot Hugger will prevent their feet from slipping off of the footrests or becoming entangled under the chair. Patients with wheelchairs face the issue of their feet slipping off the footrests. This can cause discomfort and entangling under the chair. An excellent remedy to this issue is a simple pad like this product to help prevent the feet from slipping off. This Wheelchair Foot Cushion features additional padding on the bottom that can help the patient be more comfortable since their feet are on the pad and no longer on the basic footrests. Wheelchair Foot Hugger securing method is with the effective hook and loop design. This design makes securing the pad easy, adjustable and secure. This product has an additional benefit of it's quick release buckles. This can make the removal of the pad quick and convenient. It fits 18 inch wide wheelchairs and is covered in a wipe clean vinyl cover. Acquire the comfort this pad can deliver. BUY Posey Foot Hugger from Vitality Medical today.